No new polls today, but we have some homework to catch up on. In particular, the issue of what to do with Ralph Nader. Please don't make any suggestions. I don't like obscenities. Nader has definitively failed to get on the ballot in AZ, CA, GA, ID, IL, IN, MD, MI, MO, NC, OK, PA, and TX. He is still pending in some others. Starting today, the spreadsheet will have a dark gray box in the states where he is not on the ballot and polls including Nader will not be used in those states. 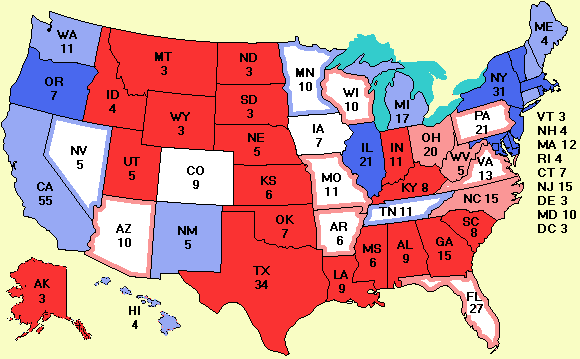 Key swing states where Nader failed to qualify are Michigan, Missouri, North Carolina, and Pennsylvania. In those states I have replaced the polls with Nader to those without Nader. No states switch sides, but some are closer. In Florida, Mel Martinez (R) and Betty Castor (D) won their respective Senatorial primaries and will face off in November for Bob Graham's seat. May the man or woman with the best little notebook win. Florida may be a doubleheader this year: it may decide both the presidency and the Senate. Starting today another feature has been added to the site. For a few days now there have been regression lines on the state graphs that project out to Nov. 2. An obvious question is: can you take all the projections for Nov. 2 and put them in a spreadsheet and run the mapping software on the spreadsheet to get the projected final map? The answer is: yes. Thanks to the programming efforts of 'Grumpy' and Eric Paulson of Viking Web Development, the projected final map and spreadsheet is now available and will be a daily feature. All projected maps will be linked to their predecessors so you can see how it evolves in time. A couple of words of warning however. For some states, like Florida and Ohio, there are lots of data points and the regression line is quite believeable. However, in a few states, such as Oklahoma the data are scarce and noisy. The regression line for Oklahome predicts a tiny Kerry victory there, which is exceedingly unlikely. But if you look at the graph, you can see that the line looks completely plausible: Bush has lost ground there. As more polls become available, the fewer states will have a prediction that is clearly not going to happen. For the moment, I wouldn't take this map too seriously, but a month from now it might be a good indicator.